Spiñata Grande slot machine from NetEnt is a Mexican themed game that combines a very catchy mariachi soundtrack with piñata symbols on the games 5 reels. The mobile slot also features some pretty unique game play because the symbols are all different sizes which creates some interesting winnings combinations. There is also a bonus round which rewards players with between 5 and 11 free spins. We have selected a great bonus for you to try the game which is after the Spiñata Grande slot review below. Looking quite unlike any video slot we’ve ever played, NetEnt slots’ Spiñata Grande slot is a colourful title featuring animal piñatas, carnival confetti and the upbeat music of a mariachi band in full voice. Boasting five reels and 40 fixed paylines, the Spiñata Grande slot machine is unique thanks to the presence of colossal symbols – regular icons that span either four or nine spaces on the gameboard – and these can create some epic winning combos if they line-up correctly, including the maximum 120,000 coins. Spiñata Grande also features a mini-slot machine that always awards a cash prize and can also hand players between 5 and 11 free spins. We found this feature to be incredibly profitable thanks to the presence of colossal wild icona that can occupy nine spaces on the gameboard to complete paylines. 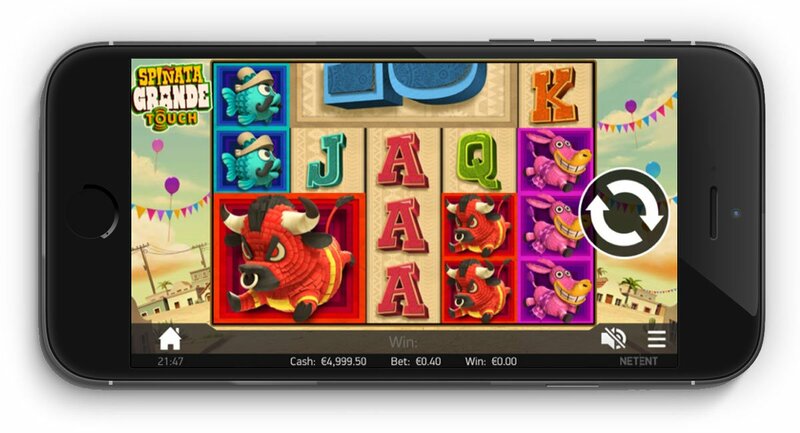 While the colossal symbols are a handy addition to the Spiñata Grande slot’s base game that can significantly boost your profits, the real meat of the title lies in its mini-slot feature. Occasionally appearing as a 3×3 icon, this mini-slot machine will trigger an additional spin on all spaces that it occupies, with gold, silver and bronze coins awarding instant cash payouts and star piñata icons offering free spins. Though the mini-slot machine will always award a prize of some description, if you’re lucky enough to match three star piñatas you’ll instantly receive five free spins, with a further spin added for each additional piñata. These free spins are exceptionally valuable as only the higher value animal piñatas will appear as colossal symbols during the feature, with a giant 3×3 skull icon providing further value. When it appears during free spins – which is actually relatively frequently – the giant skull piñata will turn up to nine spaces wild, completing multiple winning paylines and awarding some monstrous wins. In fitting fashion, each of these big wins is greeted by blowing trumpets and sprinkling of confetti, adding an extra party feel to what will hopefully be a prize payout worthy of celebration. Overall, the Spiñata Grande slot is a hugely entertaining game with enough big base game wins to keep players chasing the bonus feature. When free spins do come around, they are incredibly rewarding due to the presence of colossal wilds and can instantly wipe out a long barren streak in only a few turns. Like the Spiñata Grande slot review? Check out these as well…..